The first two decades after the economic reforms of 1991 marked the high noon of Indian capitalist enterprise. From the 1950s through the 1980s, gross fixed capital formation in the private sector averaged between 6.4% and 9.6% of India’s GDP. That ratio climbed to 14.5% in the 1990s and, then, soared to an average of 21.1% in the first decade of this century, before peaking at 24.7% in 2011-12. The above surge was largely due to globalisation and liberalisation. 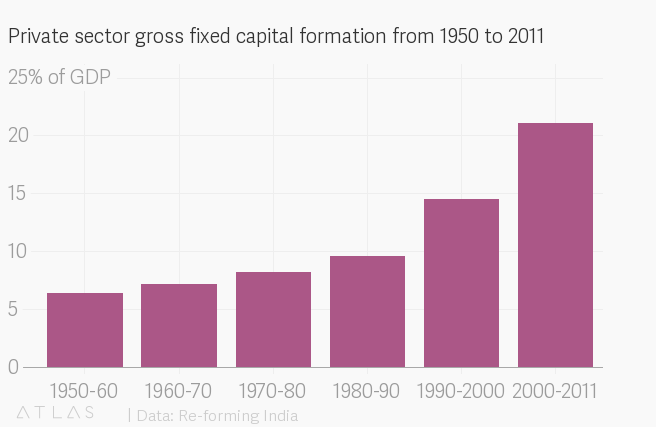 In short, the 20 years after 1991 can be called the golden age of Indian capitalism. This fairy-tale story, sadly, ended after 2011-12. Like all good things, it probably had to. 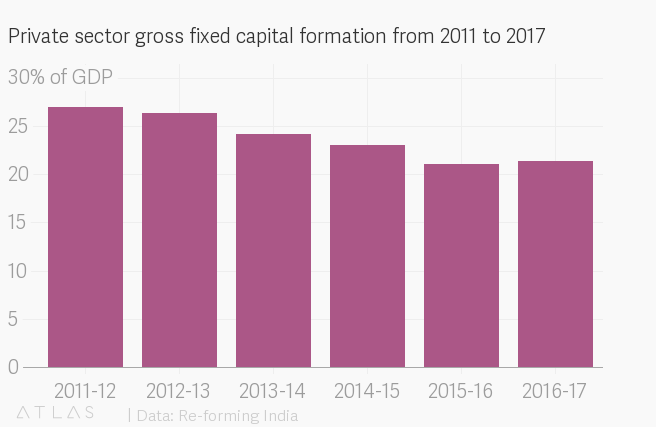 Gross fixed capital formation in the private sector, as already alluded to, peaked at 27% in 2011-12. Subsequently, however, it fell steadily to touch 21.1-21.4% in 2015-16 and 2016-17. And most strikingly, there has been no recovery even with a supposedly pro-business “minimum government, maximum governance” regime of prime minister Narendra Modi taking over the reins in New Delhi after May 2014. But the current decade’s story isn’t just of an investment slowdown. It is also about a drying up of the supply and growth of new entrepreneurs. The first two decades after reforms unleashed entrepreneurial energies, both through new and old players, on an unprecedented scale. By contrast, the number of new big names—whose growth is a phenomenon of not beyond 10 years—can be counted on the fingers of, maybe, two hands. They include Baba Ramdev and Acharya Balkrishna of Patanjali Ayurved, Sachin and Binny Bansal of Flipkart, Vijay Shekhar Sharma of Paytm, Kunal Bahl of Snapdeal, Bhavish Aggarwal of Ola Cabs, Ritesh Agarwal of OYO Rooms, Byju Raveendran of Byju’s, Naveen Tewari of InMobi, Hari Menon of BigBasket, Deepinder Goyal of Zomato, Chandra Shekhar Ghosh of Bandhan Bank and Manish Sabharwal of TeamLease. Most of them—barring Patanjali (FMCG), Bandhan (banking) and TeamLease (human resources outsourcing)—are confined to a narrow business segment of e-commerce or mobile-enabled services. The drying-up of new enterprise is, moreover, only a part of the story. Equally significant is the destruction of capital that has taken place. This capital was basically created during the previous boom period, on the back of excessive risk taking and piling up of debts by corporates. In November 2012, the Swiss investment bank Credit Suisse estimated the aggregate debt of a sample of 3,700 listed companies at $401.2 billion or nearly Rs21.8 lakh crore. Out of this total amount, Rs6 lakh crore or nearly 28% was with companies having an interest coverage ratio of less than one; simply put, the profits from their operations weren’t enough to service debt. A subsequent Credit Suisse report five years later, in November 2017, showed the overall debt figure of the 3,700 sample firms at $530 billion or Rs34.5 lakh crore. But by this time, the share of loans with companies having interest cover below one had risen to Rs13.9 lakh crore or 40%. How had things come to such a pass? Well, during the boom, there were not only businessmen wanting to expand through making fresh investments or even undertaking acquisitions within and outside the country. Their “animal spirits” had also rubbed off on lenders, who believed that the cash flows from these projects would comfortably meet future debt service obligations. An indicator of the shared confidence was that between 2006-07 and 2011-12, the borrowings of just 10 corporate houses zoomed from just Rs1,00,400 crore to Rs5,54,800 crore, with the latter amounting to about 13% of the Indian banking system’s loans. This was “animal spirits” too, except working in the reverse. When the bets went horribly wrong—the average interest cover of the 10 groups alone fell to 0.8 by 2014-15—it resulted in what the chief economic adviser to the Modi government, Arvind Subramanian, was to term the Twin Balance Sheet (TBS) problem. On the one side of this were the highly leveraged corporates struggling to generate cash flows and being in no position to invest further. At the other end were the largely state-owned banks, saddled with bad loans and displaying risk aversion in extending more credit. For evidence of capital destruction, it is just enough to identify companies/groups that are heavily indebted or have gone belly-up in the last 5-6 years. Notable names—the list by no means exhaustive—are Essar, Jaypee, Videocon, Reliance (Anil Ambani), UB (Vijay Mallya), Ballarpur Industries (Gautam Thapar), GMR, GVK, Lanco, IVRCL, Soma Enterprise, Bhushan (Brij Bhushan Singal), Jindal Steel, Zee/Essel Group, Monnet Ispat (Sandeep Jajodia), Jet Airways, Electrosteel (Umang Kejriwal), Alok Industries, Amtek Auto, Suzlon, KSK Energy (KA Sastry), Braj Binani, Ruchi Soya (Dinesh Shahra), Moser Baer, Hindustan Construction (Ajit Gulabchand), Nagarjuna Fertilizers (KS Raju), Punj Lloyd (Atul Punj), Era Infra (HS Bharana), JBF Industries (Bhagirath Arya), Unitech (Ramesh Chandra), Bajaj Hindusthan (Kushagra Bajaj), Shree Renuka Sugars, Winsome Diamonds and Gitanjali Gems. Their promoters are mostly the 1991 reforms’ children, whose capital accumulated during the first two decades after liberalization has undergone destruction. And this isn’t the “creative destruction” of Joseph Schumpeter, given that there isn’t much new capital or enterprise replacing what has suffered ruination in the last 5-6 years. Between 13 September 2013 (when Modi was declared the BJP’s prime ministerial candidate) and 16 May 2014 (the day the national election results were declared), BSE’s benchmark Sensex index rose over 22 per cent, from 19,733 to 24,122 points. The underlying driver was hope—from a man, who, as chief minister of Gujarat, had presided over an average annual net state domestic product growth of 10.3% from 2002-03 to 2012-13. He was someone whose doors were always open for business and knew what business wanted. The best proof of it was his October 2008 “Welcome to Gujarat” SMS to Ratan Tata, inviting him to shift the Nano car factory of Tata Motors—following protests at the original site in West Bengal—and allotting 1,100 acres of land for the same within three days. Modi inherited an economy with its “twin deficits” (TD) problem. But even as the TD troubles had receded into the background, there was another source of macroeconomic instability—the TBS problem—whose seeds were sown during the UPA years. That, we know, was a time of irrational exuberance, when private corporate investment as a proportion of India’s GDP soared from under 6% in 2003-04 to 14.3% by 2007-08; it later fell to 10.4% in 2010-11 and 9.4% in 2011-12, but stayed well above the 5.3-6% range of the early noughties. This capital spending binge was substantially financed by banks. When those investments soured, so did the loans extended by banks. It isn’t that the Modi government was unaware of the fallout of a debt-fuelled investment bubble. The issue was, indeed, flagged in the finance ministry’s mid-year economic analysis tabled in parliament on Dec. 19, 2014. The magnitude of the problem was possibly underestimated. With economic growth recovering to 7.2% in 2014-15 and 8.1% in 2015-16—from 5.4% and 6.1% in the last two years of UPA—the conditions were most opportune to undertake a clean-up of bank and corporate balance sheets. The process of de-leveraging via resolutions and liquidations would definitely have entailed pain and job losses. But these effects were likely to be less in a growing economy. This is where demonetisation had a negative impact, by slowing down growth and also taking the policy focus away from the TBS problem. By March 2017, the stressed advances ratio of PSBs had touched 15.6% and climbed further to 16.2% in September 2017. In January 2009, the admission by Satyam Computer Services chairman Ramalinga Raju of fudging his company’s books to the tune of Rs7,136 crore sent shockwaves across the corporate world…Raju was viewed as the odd isolated rotten apple in the pack. Raju was viewed as the odd isolated rotten apple in the pack. But cut to the present where the sordid revelations about Vijay Mallya, Mehul Choksi, Nirav Modi and Nitin Sandesara—fugitive tycoons who siphoned off thousands of crores of bank money through dubious transactions and to shell companies—have produced business cycle. In the Indian case, disillusionment roughly set in with the end of the long boom following the first two decades of liberalisation. That was roughly when the word “crony capitalism” also started gaining currency, in both academic writings and public discourse. Indian capitalism is today faced with a crisis of credibility and legitimacy last seen in the 1950s…RBI data shows large borrowers—those with outstandings of Rs5 crore and above—to account for 54.8% of the gross advances and 85.6% of the NPAs of scheduled commercial banks as on March 2018, with the corresponding shares of the top 100 alone at 15.2% and 26%. Without a clean-up of corporate and bank balance sheets—made worse by the liquidity problems enveloping non-banking financial companies (NBFC) after September 201827—it would be unrealistic to expect any resumption of the investment cycle. Excerpted from Re-forming India, edited by Niraja Gopal Jayal, with permission from Penguin India. We welcome your comments at ideas.india@qz.com.